It’s a new week and we’ve got more interviews from San Diego Comic-Con and Gen Con coming up! While you await that, here’s some comic news and reviews from around the web. The ComiChron – Rebirth helps DC edge past Marvel in July 2016; Justice League tops charts in $50.5 million month – Some more details on July’s sales. Kotaku – Now This Is A Good Transformers Movie – Yes, much better than expected. Talking Comics – Some Musings on Miracleman – What do you all think? The Beat – Dragon Con announces its first nominee slate for the Dragon Awards – Congrats to all! It was new comic book day yesterday! What’d everyone get? What’d folks enjoy? What’d you dislike? Sound off in the comments below! While you do that, here’s some comic news and reviews from around the web in our morning roundup. The Beat – San Diego Comic-Con not on board with Chargers plans for new downtown stadium – Yeah, you usually talk to folks before name checking them as part of your pitch. Nothing But Comics – Life During Miracleman’s Golden Age – A good read. The Beat – French publishers announce boycott of Angoulême after disastrous 2016 festival – Good. Women Write About Comics – A Man Created My Goddess: Dawn and Me – A really good read about influences. This final issue of “The Golden Age” story is a beautiful, reflective piece. For those who have read Miracleman, it is a poetic closure. Do not be mistaken, though. Anyone walking into this “fresh” will not be able to appreciate exactly what is happening and may find it an uninteresting, meandering affair. Following the apocalyptic climax of Miracleman #15 (we use specificity here to emphasize if you have not read it, you should), Miracleman decided to take over the world in order to save it. Neil Gaiman and Mark Buckingham’s run, titled “Book Four: The Golden Age”, explores the world he created. Nine years later, the series has followed different characters to explore where mankind fits into this new world and how life has changed. This issue, “Carnival”, revisits each of the characters from the previous issues as they attend the remembrance ceremony in London, 1994. Though reflective, Gaiman continues to expand the nuances of this world that make it such a different world from that in which we live. Open and diverse sexuality, the reintegration of extinct species, flying babies and talking animals, London has come a long way. It may seem like whimsical indulgence to a new reader, but for those who have read from the beginning, the world has emerged from the darkness of the “Olympus” storyline and truly become a place of miracles. One of the best scene features the “spaceman”, a pharmaceutically-powered oracle. Here we see our characters looking back at their losses and see what hope they have for the future. The spaceman, a character so perfectly typical of Gaiman that you could look at a single panel and know who was writing it, provides abstract feedback that prevents the reader from feeling like they are being spoon-fed a “and they all lived happily ever after” conclusion. Instead it promotes thoughtful consideration by both the characters and the reader, making Carnival come to life all the more. Even Miracleman attends, though it’s only apparent from his color scheme, to seek advice. This story, which has always viewed Miracleman from a reverent distance, revisits his own humanity and uncertainty. This god-like entity, who long ago shed his mortal form, is humanized by Gaiman’s choice to not only admit doubt but seek validation. In the same page, he maintains his superiority as he is the only one who understands the oracle’s abstraction and walks away with clarity. By doing so, Gaiman proves the core elements of Alan Moore’s Miracleman are still present, a chance we have not yet had as the character has been so rarely seen. Perfectly balanced, reminding us there are always bad apples in society who will long for darkness, the issue is a complete image of the new world. Connecting not only to the violence of “Olympus” as characters still wander the old killing fields, but to the optimism of happy endings discussed in the opening, the last few pages are lovely and healing in their imagery. It’s a new week with C2E2 all over. Were there any announcements that got you excited? The Beat – It’s the Golden Age of Superhero Communism: Enter Miracleman by Gaiman & Buckingham – Can’t wait to read this. The Wallstreet Journal – 50 Years of ‘Avengers’ Comic Book Covers Through Color – This is awesome. iO9 – Top Ten Marvel Villains to Adapt to Live Action – Some good choices here. What would you want to see? It’s a new week! What has everyone excited? We’ve got all goods of stuff on tap for today, so come back often. Bleeding Cool – Disney’s Frozen Graphic Novel Gets Over 100,000 Preorders – Glad to see something. Massive fail overall. The Mary Sue – Hasbro To Help “Operation” Board-Game Inventor Afford $25,000 Medical Procedure – Good to see the company stepping up. ICv2 – Stan Lee Media Loses Twice – How are they not paying the other team’s lawyers fees now? How much is being spent on all of this!? PSFK – Chilling Graphic Novel Unfolds Exclusively on Instagram – Very cool! National Post – Rare ‘Jewish War Heroes’ comic from 1944 found in box of donated used books – Very cool to see. A nice piece of history. Marvel Has Unveiled an Alex Ross Miracleman Variant Cover! This week Marvel unveiled a beautiful jaw-dropping variant cover to Miracleman #5 created by the legendary and prolific painter Alex Ross! The issue kicks off the second arc of the series and hits shops this May! 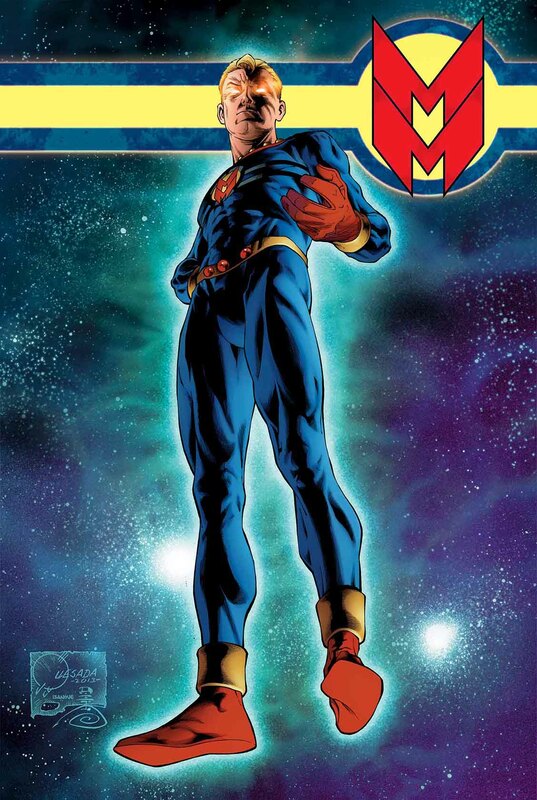 With the utterance of a single word, Michael Moran transforms into the extraordinary –and Miracleman is born! But who created him? The twisted genius who gave birth to Miracleman has come forth, initiating a long-held plan that threatens the future of Miracleman and his entire family! Who is Dr. Emil Gargunza and what is Project Zarathustra? The secrets will be revealed when Book Two: The Red King Syndrome begins in Miracleman #5! Additional Variant Covers by JIM CHEUNG & HUMBERTO RAMOS Variants Also Available! Preview: A Legend Reborn – Your First Look at Miracleman #3! It’s the story everyone is talking about – and today, Marvel is proud to present a look at the newly remastered Miracleman #3! The series that changed comics forever has finally returned to comic shops – and now is your chance to experience these stories like never before! In addition to material originally published in Warrior Magazine, Miracleman #3 also contains new behind the scenes material about the making of this historic and iconic series. It’s a new week of comics and there’s a massive list of fantastic releases coming out, in monthly floppies, trade paperbacks and graphic novels! Check out below for your best bets this week! Top Pick: Furious #1 (Dark Horse) – I’ve been looking forward to this series since I caught a glimpse of it at last years Baltimore Comic Con. The comic looks at superheroes through the lens of celebrity. Expect a review up today, and I’ll give you a hint… I liked it a lot! Black Science #3 (Image Comics) – Image Comics’ series mixes mad science with mad humor. The writing, world, story, art, all mix together for one of the strongest debuts of a series lately. East of West #9 (Image Comics) – An apocalyptic western, the comic takes place in an alternate United States where the Four Horsemen of the Apocalypse run free. It’s everything I want in a western infused with sci-fi elements. The Final Plague #4 (Action Lab: Danger Zone) – Every issue gives me the creeps. This horror series is that good. Miracleman #2 (Marvel) – A chance to read one of the most heralded comic series. Reprinted for a new generation to enjoy. Revival #17 (Image Comics) – I think this zombie series might be better than that other one that gets all the notice. Focusing on the people in a quarantined town, each issue is a slowly revealed mystery. Saga #18 (Image Comics) – Universally loved. It topped “best of” lists in 2013 and 2012. Find out why before you get too far behind. Serenity: Leaves on the Wind #1 (Dark Horse) – The popular cult tv series returns to comics! Superior Spider-Man #26 (Marvel) – Dan Slott starts his end game for story lines he’s been manipulating for years. One of the best superhero comics on the market. Thief of Thieves #19 (Image Comics) – Catch this one before it hits the tv screen. An entertaining series about the world’s greatest thief. Top Graphic Novel/Tradepaperback: Snowpiercer Vol. 1 (Titan Comics) – This graphic novel will have a movie based on it out soon. Mankind survives on a train that never stops, protecting them from bitter cold. It’s a fascinating study on class and country. Yesterday was new comic day! What’d everyone get or plan on getting? CBR – CW Confirms Wonder Woman Prequel Series Not Going Forward – Not shocking. This week we continue the new format of our top picks with some of the contributors to the site pitching in and saying what comics they’re looking forward to this coming week. Top Pick: Night of the Living Deadpool #1 (Marvel) – You had me at Cullen Bunn. The writer of Helheim penning a four-part zombie Deadpool miniseries is a no-brainer…literally. Batman Li’l Gotham #10 (DC) – This digital-first series concluded last month after 24 issues, and it couldn’t have been more fantastic. Dustin Nguyen’s water colors in a child-friendly Gotham made for an exceptional run. I have them all on my iPad, and I STILL can’t wait for the trades. Disney Kingdoms Seekers of the Weird #1 (Marvel) – I know, it’s a weird title, but I’d read about this series a while back and something makes me want to pick it up. The X-Files: Conspiracy #1 (IDW) – If this is what I think it is, the Lone Gunmen are crossing over with Ghostbusters (and other familiar characters) in a short two-issue series. Yup. Trade Pick: Ten Grand TP Vol 1 (Image) – I’ll be honest, I left when Templesmith left, but every issue he’s on is extraordinary, and this trade collects them all. Top Pick: Miracleman #1 (Marvel) – Marvel reprints the classic series for a new generation to enjoy with all new material for folks to check out. I myself have never read the series (I think) so look forward to getting a chance to finally read what I’ve been told so much about. Black Dynamite #1 (IDW Publishing) – Um, how can you not want to read a comic based on the cult movie?! Curse #1 (BOOM! Studios) – A new horror series from BOOM! A man heads into the woods in hopes of picking up a bounty to save his son, but of course there’s a twist. Indestructible #2 – I loved the first issue from Darby Pop Publishing which has an average guy is mistaken with having super powers. Some really good humor mixed with the usual super heroics. Skyman #1 – A new series from Dark Horse and Joshua Hale Fialkov is part of the publisher’s reinvigorated super hero line. The first issue is a great kick off.